A researcher at Johns Hopkins University is saying he’s developed the first simple, affordable screening for esophageal cancer, a disease that kills 400,000 people worldwide every year. WASHINGTON — A researcher at Johns Hopkins University is saying he’s developed the first simple, affordable screening for esophageal cancer. Dr. Stephen Meltzer, a gastroenterologist and professor at the Johns Hopkins University School of Medicine, and his team have developed a test they call the EsophaCap — a test that collects genetic material that can detect changes in the cells that line the esophagus, the university said in a statement Tuesday. The EsophaCap is a capsule with a string attached. The patient swallows it, and after about a minute the coating dissolves in the stomach, uncovering a sponge that’s two centimeters wide — about three-quarters of an inch. 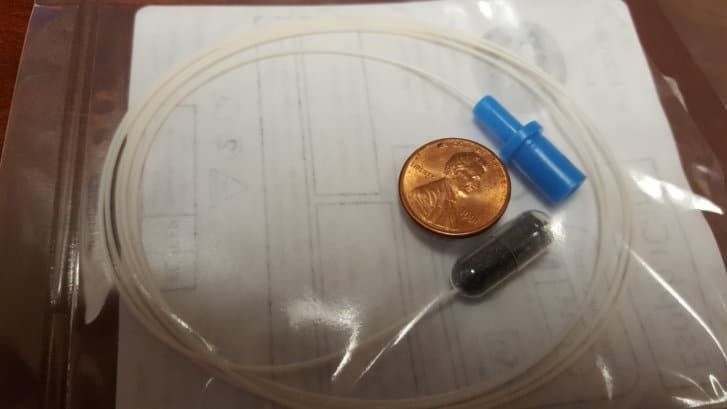 The screener then pulls the sponge out by the string; as it travels up the patient’s esophagus, the sponge collects genetic material that detects a condition called Barrett’s esophagus, which can be a precursor of esophageal cancer. Currently, patients who may have esophageal cancer undergo endoscopies and biopsies, which the university said in a statement were inexact and expensive. “It’s actually possible to miss early cancerous cells using endoscopy with biopsy and most patients with Barrett’s don’t ever undergo endoscopy,” Meltzer said in the statement. Esophageal cancer kills more than 400,000 people worldwide each year, Johns Hopkins said in the statement. Without screening, patients and doctors don’t know whether patients have the disease until symptoms develop, which is often too late. Meltzer published his findings in the journal Clinical Cancer Research.